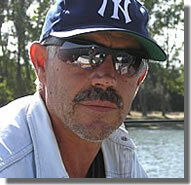 My name: Sergey Svistula, 50 y.o. Hello! I am from Kherson, the beautiful riverside city in the southern part of Ukraine. The brightest feature of our region is a wonderful unique wild nature with its huge amount of water resources around. Kherson city is stretched out in the mouth of the Dnieper River (the cleanest river of Europe!) and is famous with hunting grounds and quiet back-waters. It is only 20 Miles till the Black Sea. 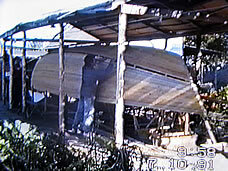 So I naturally spent my childhood on waters where we went for a row on the old fishboat we repaired themselves. After I finished the technical department of the University I have built my first "boat". It was a simple windsurf board made of veneer - a very popular fun of that time. But I thought about real sailing yacht. 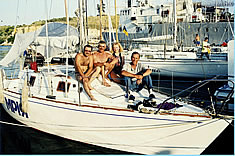 The ultimate decision to own the yacht had come when we made one-week-long trip to the Black Sea using our windsuft boards. I clearly remember that windy day. 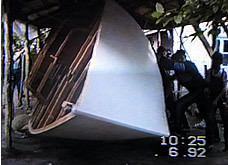 The boards were overloaded with sacks of equipment and the custom sails had not got optimal shape. Our windward progress against W Force 5 wind was not successful. We were wet and cold. And the fleet of wonderful yachts taking part in the sailing race overtook us easily and smiling faces aboard looked at us amazingly. I decided to build a wooden yacht. To build myself. There were no other way to have the yacht that time. 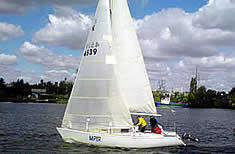 Having technical education I had not much problem to develop the yacht design. 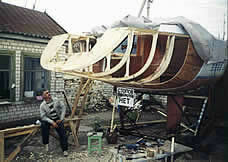 Moreover I have already got some experience being in couple projects of yacht building and I realized clearly it would take much time to complete the joinery and metalwork. I invited my friend Igor to help me to make this idea real and we started to gather the necessary goods. The loft was set in April, 1990 at my mother's backyard...The five longest years of the hard work have been finished when my "dream" was launched in 1995. 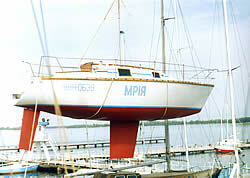 She was called "Mriya" ("Dream" in Ukrainian). 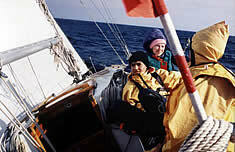 Presently "Mriya" is a 9.0m bermuda sloop, 46 m² of sails area with a top staysail originally designed with LOA 8.30m. 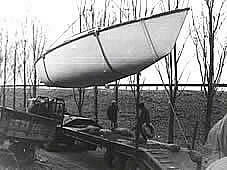 But the first sailing races showed that she had too narrow aft (accordingly to IOR requirement) and it decreased the ablsolute speed of the hull. I wanted to run faster so the upgrade of the aft part of the hull was recognized as necessary. 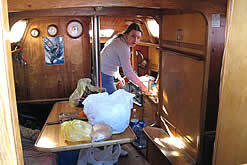 And the last Autumn, 1999, she was set for renovation. 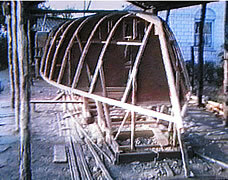 The aft part of the hull was cut and new plating and transom were fitted. The speed increase run up to about 0.5 khot when reach and she became able to surf on waves. The renovation results have revealed immediately. 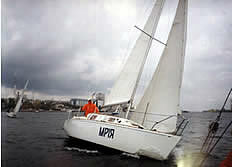 "Mriya" becomes the winner of many sailing races and National Championships. 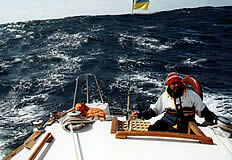 The next leg was to change the mast. The old one was created of aluminium pipe for watering and had the diameter of 110mm. We bought the teardrop-shaped mast profile from Ukrainian manufacturer and completed all metal work themselves. It took about a half of year till we set the mast with spreads and new 1x19 stainless still shrouds and stays.
. Despite our yacht is 12 years old, she looks nice and I am going to enjoy sailing and racing aboard MRIYA for many years yet.